Trevor Gumbi. Comedian. Comedy MC. Trevor Gumbi is an outspoken and controversial comedian. Trevor Gumbi is a favourite in the corporate market. Trevor Gumbi can be found entertaining from the lowest clerk to the highest manager. They love his style of comedy. Trevor Gumbi is also an acclaimed actor with shows like “Rockville”, game show “Lucky Truck” and stars in City Ses’la. Trevor Gumbi writes, directs, does voice overs and hosted TV Shows. Trevor Gumbi has performed at all the major comedy events all over the country, including Kings & Queens, Rocking The Daisies, Kingsize, Blacks Only, Laugh Out Loud, Arts Alive and Oppikoppi. What a jack of all trades!!! 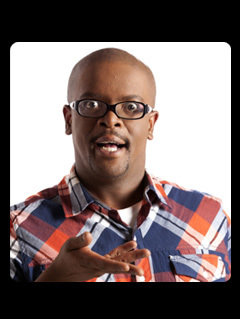 With Trevor Gumbi’s expressive eyes, facial expressions and energy he has his audiences in stitches. Trevor Gumbi always arrives on time and that he puts down to him driving his scooter. Trevor Gumbi says that even though it’s difficult to tweet while riding it’s very economical.